Steel Spokes - Stacy, Minnesota - Wyoming Machine Co.
At Wyoming Machine, Inc., we specialize in custom metal fabrication and forming based on the specific needs of our customers. We were recently contacted by a commercial playground systems customer to fabricate custom steel spokes for a freestanding spinner. Utilizing a customer-supplied 3D CAD model and specifications, we formed the steel spokes with one of our 125 Ton press brakes. A unique custom built tool was necessary to achieve this unique shape made from 1/4" thick steel material and shows how our company goes the extra mile to ensure quality and precision on all of sheet metal bending projects. 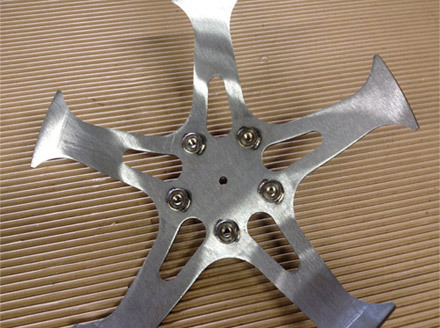 In addition to showcasing our laser cutting and forming expertise, this project enabled us to bring our spot-welding and fusing capabilities to the forefront. The 2-5/16" high part was finished with zinc plating; it underwent dimensional and visual inspections for quality and precision, and was completed within 3 weeks. 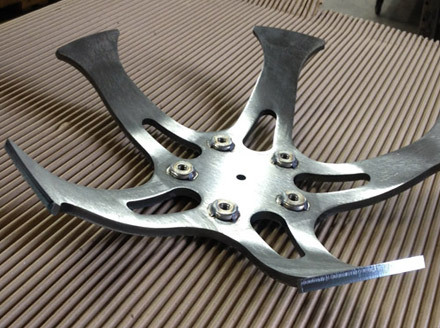 The customer orders 350 spinner spokes per year, a testament to our craftsmanship and customer-centric objectives. Contact Wyoming Machine today to learn how we can partner with you on your next metal forming project. 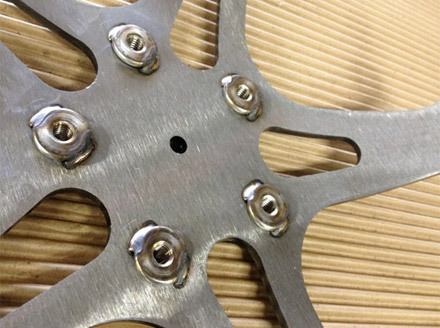 These spokes are for a Freestanding playground spinner. + 0.005" / - 0.000"